Hi! Today’s post is a pink post! I currently joined the #gopinkwednesday tag [I wasn’t invited by anyone, I just want to show support], which is the same as Polish Us Pink. You can post your #gopinkwednesday manicure on Instagram or on your blog in the month of October. This is also in support of Breast Cancer Awareness. I heard of it from Lacey aka http://www.laceandlacquers.com/ via Instagram and well I thought it would be fun and joined! Okay, long intro I know so now on to the manicure! First I started by applying a new nail polish by OPI, I Think In Pink. I am not quite sure if this is a new opi color or if it is just re-released. What I do know is that it is sold in a set known as the Pink Of Hearts 2012, which is a Breast Cancer Awareness Duo Set of nail polish. The set comes with this polish and also a glitter, You Glitter Be Good To Me. As you can see in the photo above it is a beautiful pink crème! Love it! With just 2 coats it was opaque, and glossy. No topcoat in the photo above, by the way. I was thinking of just leaving it as is, but I decided to add a glitter! I decided to add Hot Stuff from Models Own. Hot Stuff has a clear base with pink, gold, and silver reflective glitter!! In some directions it looks like it has blue glitter. Not sure of that, though. I think It’s the silver glitters that reflect. The glitter was easy to apply. Just one coat. What did you think of this manicure? 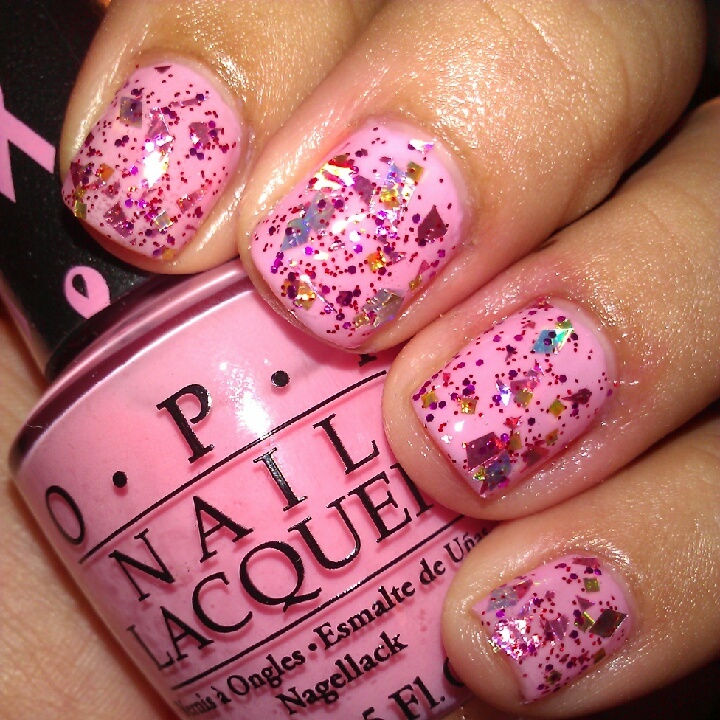 Do you own any of the previous pinks that OPI has released in the past years for Breast Cancer Awareness? Any thoughts, comments, questions, or suggestions? Leave them down below in a comment. Hope you enjoyed reading this post. Thanks for reading and stopping by! 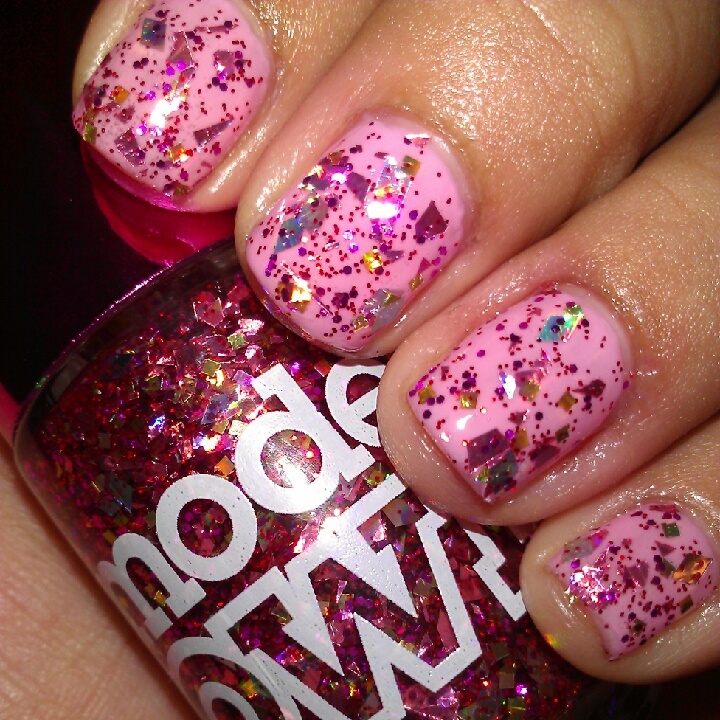 This entry was posted in Models Own, OPI and tagged Glitter, Go Pink Wednesday, Models Own, OPI, Pink. Bookmark the permalink.